Channel 16 is for hailing or distress calls only. You may not chat on channel 16. Use 9 or a working channel. Every channel on VHF radio has a specific purpose. Channel 16 is for hailing and distress messaging only. It is meant to be monitored all the time while underway to assist in emergencies if necessary, to hear Coast Guard alerts for weather and hazards or restrictions to navigation, and to hear another vessel hailing you. This channel should never be used for casual conversation or performing a radio check. Please keep in mind that you could (without even knowing it) be preventing someone from reaching help in a disaster. Obscene or objectionable language, transmission of music, and subversive transmissions are forbidden. There are individuals monitoring the airwaves and the Coast Guard can locate the origins of signals. The consequences can be severe. Children should be taught proper radio use and should never be left unattended near a radio. To hail another vessel, simply call the name of the vessel two or three times, followed by your own vessel’s name and station ID if applicable. Wait for a response then immediately switch to a working channel. For example, depress the microphone key and say “Seascape, Seascape, Seascape, this is Espresso WDA9048 on channel 16, over.” You must release the key to hear a response. The term “over” let’s the listeners know you are releasing the key. The response might be, “Espresso, this is Seascape. Switch channel 68, over.” Espresso would answer, “Espresso switching 68.” Both vessels switch their radios to 68, hail each other and converse normally. At the end of the conversation, “Espresso returning to stand by channel 16,” or “Seascape out.” The term “out” signifies that you are terminating the conversation. Never say "over and out." Those are conflicting terms. All ships should maintain watch on channel 16 (156.800 MHz) when within the service area of a VHF maritime coast station and while at sea. Ships with digital selective calling-equipped VHF marine radios should also keep watch on channel 70. After February 1, 2005 ships over 300 tons and passenger ships will no longer be required to monitor channel 16 but will be required under international law to monitor channel 70 for DSCSS signals. Vessels not required to carry a marine radio (e.g. 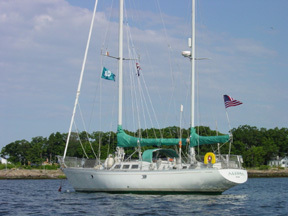 recreational vessels less than 20m length), but which voluntarily carry a radio, must maintain a watch on channel 16 whenever the radio is operating and not being used to communicate. Such vessels may alternatively maintain a watch on VHF channel 9 (156.450 MHz), the boater calling channel. Note however that urgent marine information broadcasts, such as storm warnings, are announced on channel 9 only in First CG District waters (northern New Jersey , New York and New England ). Only Channel 16 is used as the international hailing and distress frequency. 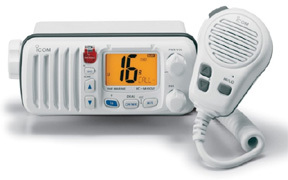 U.S. vessels required to carry a VHF marine radio, such as commercial fishing vessels, must maintain a watch on channel 16 (156.800 MHZ) while underway whenever the radio is not being used for exchanging communications. Every power-driven vessel of 20m length or greater, every vessel of 100 tons and upward carrying one or more passengers for hire, every towing vessel of 26 ft length or greater, and every dredge and floating plant near a channel or fairway, must maintain a watch on both VHF channels 13 (156.650 MHz) and 16 (156.800 MHz) while the vessel is underway. Our little friend learns how to use the radio properly by hailing a launch on channel 71, a working channel. 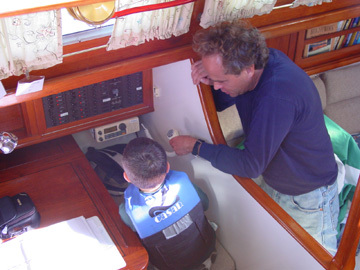 One additional rule to mind is that VHF radio is for use only on the water. Shore use is permitted only with a special land based radio permit which is what yacht clubs and marinas have which allows them to talk from the dock house to vessels on the water. If you go ashore with your handheld and you call someone aboard your vessel, you are in violation of the law. For that use, FRS two-way radios that now have suitable range for contact within several miles’ radius are widely available and great for staying in touch with your shore crew. They are also quite useful for communicating from above decks to below and bow to stern while anchoring. Some radios are now even available with VHF and FRS frequencies built in. Visit http://www.navcen.uscg.gov for up to date information about designated marine frequencies. Note: On HAM radio frequencies, Break, Break, Break is the equivalent of Mayday, mayday, mayday. Never use the term "Break" three times unless there is immediate threat to life or property.